17-19God Is love. When we take up permanent residence in a life of love, we live in God and God lives in us. This way, love has the run of the house, becomes at home and mature in us, so that we're Free of worry on Judgment Day—our standing in the world Is identical with Christ's. There Is No room in love for fear. Well-formed love banishes fear. Since fear is crippling, a fearful life—fear of death, fear of judgment—is one not yet fully formed in love. 19We, though, are going to love—love and be loved. First we were loved, now we love. He loved us first. He Came to Give us the Spirit of our Father God! Hallelujah! His Help Is Always Ours-- those who Expect Him Know that sometimes His Help Comes So Swiftly we may think it is because of our prayers. Actually it is Because of our Faith, Trust and Because we Expect Him to do as He said He would. When we realize we are lacking in what we need, be it spiritual or natural, If we close our natural eyes and Allow our Spiritual eyes to See we Can refocus our perspective Higher and our Faith Will continue to lead and grow us. For those that Live by Faith and Trust in our Lord Remember that when you are faced with A problem, an issue, an unfavorable situation, rejection, trouble, etc....Remember that You Can Either look/focus on that, Or You Can focus on Your Help-Your Way Made Through. TruthBeTold, His Help Is Always There before we realize there is a problem, etc...! Prayer does not necessarily bring HIS Supply that we Need---His Supply Was Already there! Just as the answer we need is There, waiting for us to Ask the Correct Question. If you Believe Him, Then Expect Him at All Times! Expect His Supply--Know that His Supply was Provided Before the Problem/trouble arose! Speak and Live Your Faith And Trust -- Walk and Live In His Spirit! New changes, bring new challenges and instead of focusing on what is different that I need to adjust too, I am learning more and more to expect them to strengthen me, grow me and to reveal to me, what God already knows about me, but Desires to Teach me about me. That I have a radical Faith and Trust in my Lord. I'm waiting On and Expecting As Many Miracles as Necessary. Right Now IJN Father! Amen! For those who Live by Faith, who Trust by His Spirit--when A Storm comes upon us...bringing so many changes and challenges.... There is Nothing we can do but Sit in the middle of it with Him where it does Not rage. Making ourselves Focus on His Power and Love for us, not the 'what-if', and the 'could be's', and the "I need to know's', Oh, and the 'why me Lord why!?'. Those will keep us not sitting in the Middle with Him, but stepping Out into the storm itself. There are times when we are sent into the storm following the Lord, and then there are times when we need to float on the waves and bend with the wind. Discerning which one is where He wants you to be is the key. Ha! I know which one I am in right now... And believe you, I Am sitting in the Middle with my Best Friend Jesus, moving ONLY when He tells me to. 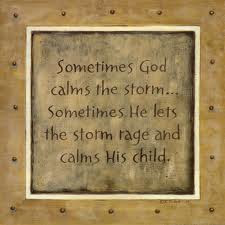 I Sit Rejoicing that My Lord Sits with me in the middle where the storm does Not rage. Help (He) Is Always Mine! His Supply Has Already Been Provided--Because He KNEW This Storm was on the Path that He Is leading me on. I completely believe this. PEACE Be Still I Say! We Must Not allow the Storm to Rage in us--Peace Be Still I say to my Heart, my mind, my Spirit In the Name of Jesus, Peace Is Mine! We are learning some different lessons in the Midst of a storm--He is holding me safe As I Pass Through This storm. A lifeguard while Saving you from the roaring waves cannot teach you how to swim at the Same time He/She is focused on Saving you from Drowning! Once I am on the Other Side, on the quiet Mountain Side, He will begin teaching me More of His Truths of His Kingdom. My faithful, sweet Lord Is Always Gracious to me--He Has Blessed me --His Face Shines on me--He Is Always Leading me on the Paths of His Ways Made. My sisters and brothers I Encourage you to Be careful, be Watchful, our enemy will Always try to Come through and into the midst of the storm and provoke us to do do something that will make things worse instead of better. Our enemy seeks to make us think, do, and/or speak when we Should not. He will use our minds, and people as doors to walk through to hinder us and stop us. I encourage you In the Name of Jesus, to Ask Jesus to Close All doors that satan is trying to come through to attack you. Do not allow his temptations to pull you away from Following and obeying Jesus as He is leading you in the Ways you Should go! "Leave No[such] room Or foothold for the devil [give No opportunity To him]." The Greater your assignment from God-- The Harder your tests will be. The More He is preparing you In Your Calling to Serve Him, to Accomplish His Will, Plans and Purposes for, in and through your life, In the Name of Jesus. DAILY PORTION--WHO/WHAT ARE WE REFLECTING?